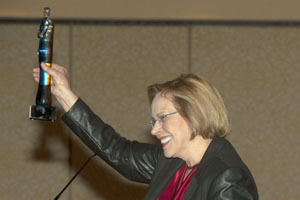 Michigan Supreme Court Justice Marilyn Kelly was named as Michigan Lawyers Weekly’s Woman of the Year at our 2012 Women in the Law luncheon on Sept. 27. Kelly has accomplished a lot in her career, including public service spanning the last 48 years. As noted in her Women in the Law profile (see our Sept. 10, 2012, edition), Kelly was the first woman elected to State Board of Education in 1964, and was re-elected in 1968 and 1972. While still on the board, she enrolled at Wayne State University Law School and graduated with honors in 1971. She was elected to the Court of Appeals in 1988, and re-elected in 1994. In 1996, she was elected to the Supreme Court for the first of her two terms. She was the Court’s chief justice from 2009-11. Her push to make courts more accessible has resulted in last month’s launch of a new legal self-help website, Michigan Legal Help. Kelly also was a loud and unwavering voice in the call for more comprehensive and fair indigent representation. She surely is gratified with HB 5804, to create the Michigan Indigent Defense Commission, going to the full House with strong bipartisan support. That Commission would set standards, attempt to stabilize funding and promote best practices. She also mentioned that she is a SCUBA diving enthusiast, and to this day still actively participates in the sport. In addition, she confessed to Ed the guilty pleasure of reading spy novels. Kelly started a Limited English Proficiency Program to assist non-English speakers navigate their way through the legal system. Her most visible effort, without question, was her work on the Michigan Judicial Selection Task Force on which she served as co-chair with Senior Circuit Judge James Ryan, of the 6th U.S. Circuit Court of Appeals. They brought together a group of lawyers, non-lawyers, businesspeople and campaigners and researched the judicial selection process. The task force released a comprehensive report calling for more transparency in the selection and campaign process and offered sensible solutions and alternatives that would make the judicial selection process more effective and transparent. Those recommendations are still being considered. Meet the Insane Clown Posse. This Detroit “horrorcore” hip hop duo is perhaps best known for its short stint in the WWE (yes, that WWE) and for showering its fans at shows with Faygo sodas. The pair, dubbed Shaggy 2 Dope and Violent J, have been around for 20 years. You can’t be a music act for that long without having a loyal fan following. It’s logo is a silhouette of a clown running with a cleaver. As you can imagine, Juggalos are largely young, white males who dress up like their ICP. 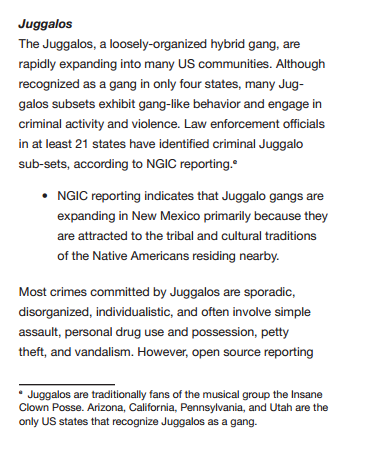 According to the Department of Homeland Security, the Juggalos are also a gang, a “non-traditional” one, right up there with the Latin Kings. Yes, America, exactly how are you supposed to respond to that? The VV writer went to the recent Gathering and heard first hand the Juggalos tales of woe. But seriously, the report is pretty strange, particularly in its description of a band’s “criminal” makeup. 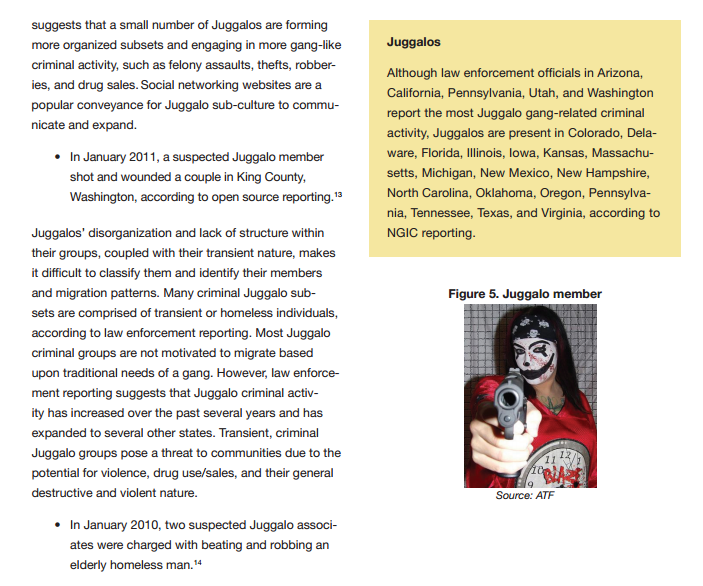 Most Juggalo criminal groups are not motivated to migrate based upon traditional needs of a gang. That’s because they are 14. And, fellas, if you don’t want you or your fans to be associated with gangs, it would help if you didn’t flash gang signs in photos on your website.